In the last decade solar cooling technologies e.g. 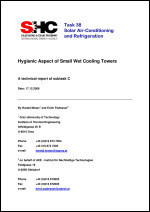 absorption, adsorption and desiccant evaporative cooling were subject to an increasing interest. In a solar desiccant cooling cycle, solar energy is used to regenerate a desiccant that dehumidifies moist air. The resulting dry air is cooled in a sensible heat regenerator and in an evaporative cooler and then is supplied to the building. By associating different elementary changes to moist air (dehumidification, sensible cooling and evaporative cooling); this technique uses water as a refrigerant and solar energy as a driving potential while electricity is only used in the auxiliaries, so the technique is environmentally-friendly. The choice of heat rejection solution is often critical to the electrical power consumption of the thermally driven chiller. The possible lowering of the electrical consumption compared to traditional cooling solutions is in many cases the driving force towards utilizing the solar energy for cooling. Therefore the total electrical consumption is crucial. 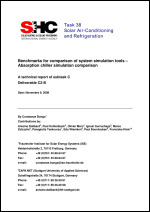 Investigation of realized systems shows that up to 50-60 % of the total electrical consumption is used in the heat rejection system, depending on the type and design of the system. This report is the result of the work undertaken by one of the working groups set up as part of Task 38 of the Solar Heating and Cooling Programme of the International Energy Agency. 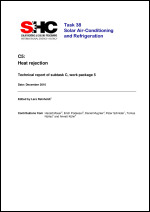 The remit of Task 38 was to study Solar Air-conditioning and Refrigeration. The work was split into four sub-tasks and these were further sub-divided into smaller sub-tasks. One such sub-task CI, forming part of the sub-task C on Modelling and Fundamental Analysis, was set up to carry out a survey on new solar cooling developments, a State-of-the-Art report. This report documents the results of that work. 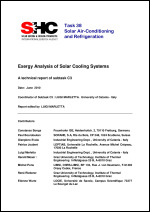 Within the Task 38, the Subtask C was devoted to the Thermodynamic Analysis of solar cooling systems. 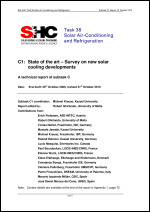 Out of the many contributions offered by the participants, those ones collected in this Report are the most representative of the research activity carried out by the whole Group in the field of the exergy analysis and its applications to solar cooling. By going through the paper, the Reader can recognize that for detecting the drawbacks of thermodynamic nature of energy engineering systems, the exergy approach is a more useful and powerful tool than energy analysis. Indeed, while the energy approach is based solely on the First Law, exergy analysis is founded on the combination of both the First and Second Law of Thermodynamics, thus offering a wider and more rational basis for investigation. This chapter shall give a very short description of thermally driven heat pumps especially with respect to the heat rejection sub-system and temperature level. Furthermore different technologies for rejecting the heat to the air are briefly discussed and compared to each other for different climatic conditions. Numerical simulation offers the possibility to study virtually physical systems and to test rapidly the proposed solutions. Simulation is then the most adapted method to understand the behaviour of a system in order to optimize it. The enhancement and the development of a technology are essentially based on the capacity to simulate accurately its behaviour in order to optimize it. This reality applies to solar cooling technologies. 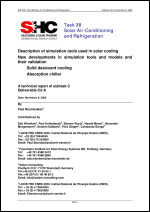 In this report simulation tools used in the solar cooling domains are described. Then the recent development in the components and system models and validation are presented. In part 1 of the report the simulation tools applicable in the domain of solar cooling are presented and the main advantages of each tool are highlighted. System simulation for planning support. Objective: to identify an appropriate system size with respect to fulfill target values in primary energy savings, solar thermal system exploitation, economics, etc. Numerical simulation offers the possibility to study virtually physical systems and to test rapidly the proposed solutions. Simulation is then the most adapted method to understand the behaviour of a system in order to optimize it. The enhancement and the development of a technology are essentially based on the capacity to simulate accurately its behaviour in order to optimize it. This reality applies to solar cooling technologies.